in my attempt to step up my daily dressing. not just cling to my cherished standbys. the only graphic T I have ever owned! The jacket is from Target. I wasn't sure how much wear it would actually get. for me to try out some different looks. ever so glad I tried it out! as I can definitely see it's versatility. then added my statement brooch necklace and black patent pumps. in Old Town Orange with my husband! Oh the fun of an outfit you just love! The glasses are all so darling on you. You are definitely a glasses and hat person. You look great in anything! Adrienne it was actually your last post working with a stylist … that got me thinking I should try new options, So thank you for the inspiration! Thank you dear Barb! Your book club sounds like such fun … enjoy!! This is so FUN!Do you follow FRENCH ESSENCE?She has talked about in the past and just recently(maybe yesterday! )about owning a leather jacket!I HAVE NEVER OWNED ONE EITHER!It has never appealed to me…………..but between her post and yours MAYBE tis time for me too!Or perhaps, I should just borrow the husbands Motorcycle leather jacket! !Think its too short for me……..I like them long to cover the back end! I'll have to check out FRENCH ESSENCE! Up until now, i really didn't think leather jackets would work for me. I saw them as too masculine … but this one changed my mind! I have always been intrigued though … with the juxtapositions available with such a strong statement piece. I already have so many ideas for this leather jacket! It is so fun trying on glasses, isn't it. You look great in ALL of them! Connie I do have quite a growing collection of glasses! I find them to be instant style infusion … and always age appropriate! Tamera, as a fellow wearer and lover of all glasses, adored all of these. The leather jacket is really good on you, something you will wear and wear, specially with your style, more joy to come!!! Thank you dear! Aren't glasses just such instant style impact! I am definitely loving this jacket … and surprised by how much! You look like you are having so much fun amping up your style! The leather jacket looks fabulous, you really can wear almost anything and look amazing. Thank you my dear! I am having fun trying to add some new energy to my wardrobe … it seems to translate to other areas of life as well! Tamera, Look at you girl! Rocking that leather jacket you are. I love how you put a very TB spin on it with that Amelia Earhart T (very cool, I love it) and the long skirt. What a great look! Also like the longer sweater look as well. I too just bought my first leather jacket a few months back (well, it's pleather actually I think), after seeing all the women in Northern Europe with them. I didn't think it was me, but now it's one of my favorite things in my wardrobe! Kim thank you so very much my dear! Fun to hear you are also enjoying the benefits of a leather jacket .. isn't finding new clothing options an intent way to add a little more style fun to your life! I loved your post on the Ritz at Half Moon Bay … especially how going there you have the benefits of natures beauty … and luxurious accommodations … a perfect getaway to be sure! Thank you ever so much my dear! Isn't the Amelia T so fun … first time i have ever owned a graphic T, and I just love it!! Thank you my dear! Fingers crossed you all make it over hear for some great golf!! Great purchase, Tamera! You look amazing in the jacket and I love all of the ways you have styled it...cool looks! Sends a message of creative, strong woman! 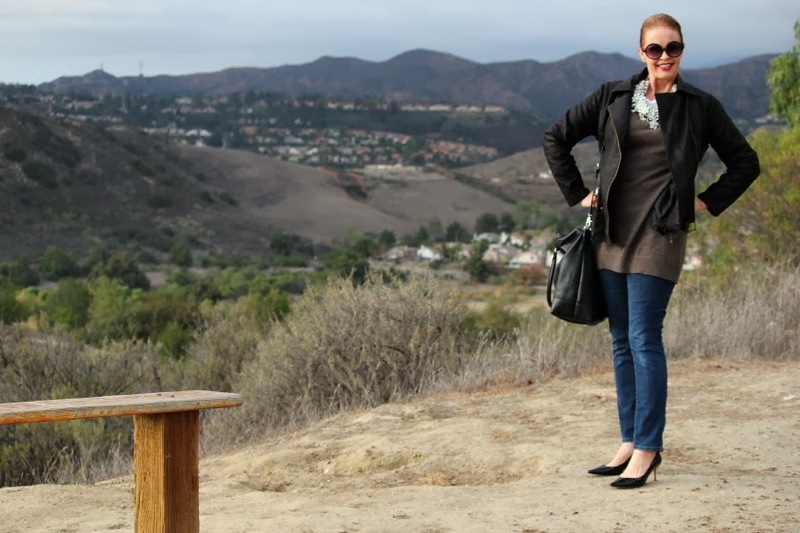 Thank you Pam … I am definitely enjoying the jacket … especially since we are Finally getting a bit of winter weather with rain!! Great jacket Tamera! You look fabulous as always! LOVE the jacket on you. Since my main form of transportation is my fuchsia Vespa, I actually own 3 leather jackets. I'm always trying to "beautify" my look because down/deep I'm not a pants person...I'm a "dress" girl. So.....I have a bright green (chartreuse?) jacket and two black ones....one a motorcycle jacket from ASOS (shout out to Grown and Curvy Woman blog). I will have to try your "edgy" look one of these days.....keep it up Tamera! The collection of close-ups is stunning, I really like. Love the willingness to experiment and try the "nevers". Even better is to have such fabulous results!! I have always loved leather jackets and have owned many through the years. My current one is a moto style one, but I'm heavier now so I haven't worn it much this year. I miss it. You look fabulous in your jacket. I really love it with the wide pants (another fave of mine). After seeing you in all the wonderful oversized frames, that's my next challenge: finding the perfect glasses!! You are inspiring. as always. 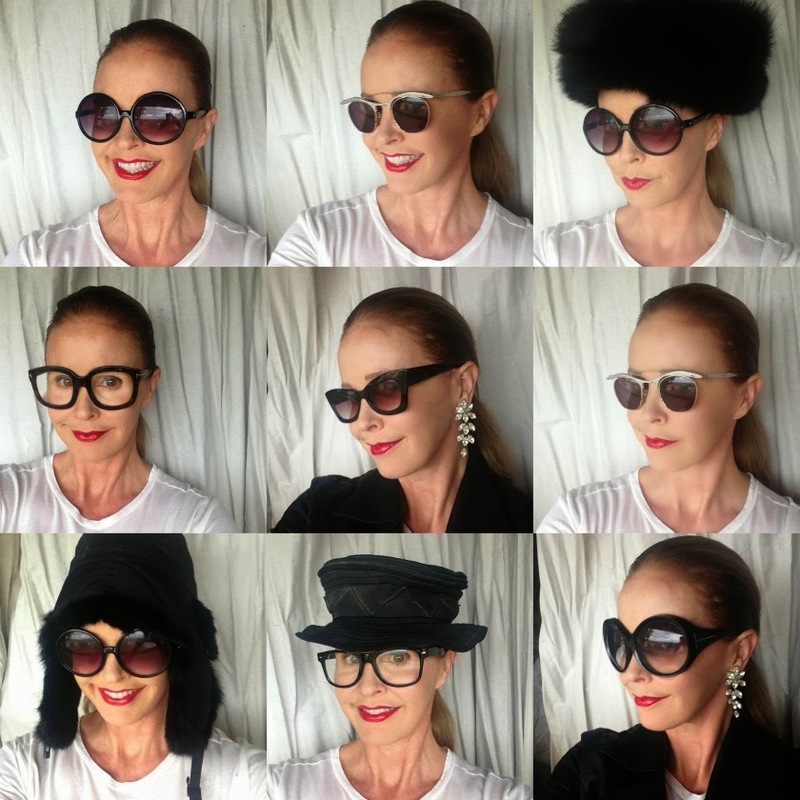 I love your dressup - incredible eyewear and hats, hats, hats! I'm glad you're loving your jacket. What a fun piece to dress up, down and even sideways. Gorgeous, gorgeous. Inspiring Tamera, I love all the styling proposals! Your experimentation inspires me! The hats, the glasses, the leather jacket. And how you creatively put it all together. It's a great idea to buy an inexpressive piece and 'try it out.' Target is the perfect venue for just that. This looks like so much fun! Playing dress up in your own closet....fun times. You look gorgeous as always. It's so great to stop by and see you.